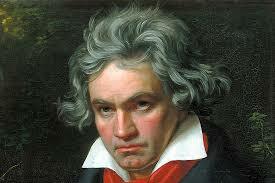 I’m sure you have all heard of the great composer Beethoven and his famous piece the 9th Symphony. It was heralded as a work of genius because Beethoven did something that had never been done before: he added voices in the fourth and last movement. He basically turned a symphony into an opera. But here’s the real kicker. He wrote that breath-taking piece toward the end of his life. In fact, when he conducted the Symphony for the first time, one of the soloists had to turn him around at the end to see the that the audience was furiously clapping. What a great lesson on the power within. Beethoven could have could have focused on his deafness – could have focused on the silence he heard coming from the outside world and never composed again. But instead, he focused on the music inside. He listened to the beauty inside and brought forth one of the great musical pieces of all time. How many times have we listened to the noise and evils of the outside world and ignored the inside of our own heart? How many times have we shunned our inner voice for the opinion of the crowd. How many times have we based our self-worth on what other people say? How many times have we given up a dream because someone “out there” said it couldn’t be done. We have to tap the power and beauty in here (in our hearts) to offset the evil and ugliness out there. The next time we are fighting the corrosive voices of the world, remember the voice of wisdom and power and beauty inside our own heart; remember that true healing comes from an inner power; remember that we can ring the doorbell of the most powerful force in the universe – anytime — and bring forth the greatest that dwells within.